Explorations in Quilting and Life: And, more progress! While Irene swirled up the East Coast of the U.S., I was busy beading. Totally coincidentally, part of my plan was to bead some swirls into the center of my current piece. So, there I was sewing swirling beads while the weather bureau filled our television screen with swirling hurricane images. I like mine a lot more! You can also get a glimpse of some of the decorative stitching and quilting lines for the center of my piece. I am more than half-way through the beading process. 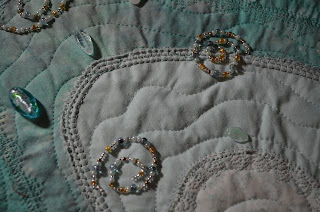 I am not sure which is more tedious - stitching the swirls throughout the center of the quilt or threading and knotting invisible thread to individually sew some 20 or more beads that I fell in love with at my local bead store, Bead Breakout. However, I am nearing completion. Already, I am planning for my next set of projects!